Moving Home After War Is Hard. But That Won’t Stop These Brothers. It was his nightly routine for years. After supper was eaten and the dishes washed, after the evening visitors had come to enjoy tea and conversation, after the children were tucked into bed and his wife began yawning, Sami moved through his home to make sure it was secure for the night. He checked the front gate to make sure it was bolted closed. He did the same at the front door, and then made sure the windows were secure. Sami’s routine is much different now. Sami and his family moved back to their hometown recently, just outside Mosul, to begin again after they were displaced by ISIS. He and his family moved back to a community destroyed by war. For now, they’re staying in the best shelter they could find—a neighbour’s house with no door to lock at night, no windows to secure. Moving home after war is hard in ways Sami couldn’t imagine. Sami and his brother Fahti were finishing up a construction training course when they heard that some of their neighbours were moving back to their hometown. Their region was finally liberated from ISIS, but the damage from war was extensive, to put it mildly. Sami and Fahti were anxious to get home, like so many refugees and displaced families. Life in a displacement camp… it is exhausting. They’ve been back for a couple months now. We checked in with Sami a few weeks ago —he was tired and discouraged. It’s not the story we’d hoped to share, but it’s the one that is true. For displaced families, the way home is almost never a straight line. Sami was second-guessing his decision to move his family back so soon. He regretted not leaving them at the displacement camp for a little while longer, while he returned home to rebuild. As hard as life was in that camp, their tent was a lot more comfortable than his neighbour’s bombed-out house in their bombed-out neighbourhood. They do have some of the basics—water is being trucked into Sami and Fahti’s neighbourhood, and there is electricity for most hours each day. But food is very expensive and hard to come by. Soon, Sami will build doors and windows to make his home secure, using the skills he learned in the training program you made possible. In a few weeks, he is hoping to be able to move his family back into their house. There will still be so much repair work to do, but they at least they will finally be back inside their own home. As Sami rebuilds, he’s not just making new doors and windows for his home. He is creating the best possible advertising for the business he will start here. Returning neighbours will see his family safe and secure in their home, thanks to Sami’s new skills—and he will be able to provide the same for them, while he provides for his family. Moving home after war is hard. But these families… they are determined. They keep going, because they know they’re not in this alone. Each time we check in, Sami and Fahti tell us how grateful they are. They tell us are grateful that we haven’t forgotten them. Forget them? 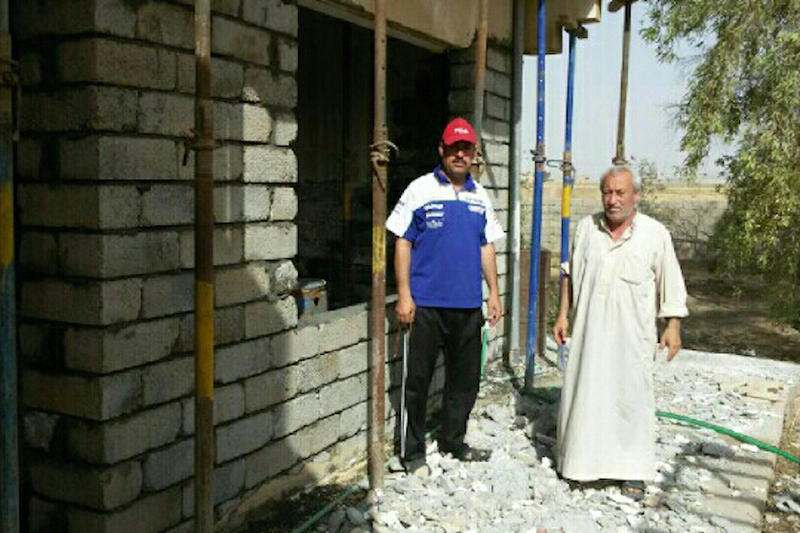 We are committed to walking along side Sami and Fahti as they rebuild—for as long as it takes. One day soon, we’ll sit in their home and drink tea and hear their stories. We’ll visit their new workshop and watch as they restore their community, one window and door at a time. One day, we will see “the more beautiful world our hearts know is possible,” right here where the rubble of war used to be. We can see it. Sami and his brother can see it. You can see it. We look forward to sharing their progress with you in the days and weeks ahead. Many more families are looking for a way home after war—and we can help them. Become a monthly sponsor, and give war-torn families what they need to survive today and flourish for many, many tomorrows.